The Level On Pro wireless are an excellent audio companion for Samsung cellphone owners. For everyone else, though, there are other less expensive, more egalitarian offerings out there. High-end noise-cancelling headphones are a tough market to break into. Around the house or at the gym, fans of pricey, decent-sounding cans flock to the Beats brand. On planes, it's like stepping into a Bose advertisement with one out of every five seats occupied by someone rocking a pair of QuietComfort 25 or QuietComfort 35. So where does that leave Samsung's Level On Pro Wireless Headphones if it can't hang out at your home or cruise with you 30,000 feet up in the air? Around the neck of hundreds of thousands of Samsung phone-owners around the world … or at least that's what Samsung hopes will happen. The Samsung Level On Pros are designed work with every Bluetooth and 3.5mm jack-equipped cell phone on the planet, but you'll really need a Samsung handset, like the Samsung Galaxy S7, Samsung Galaxy S6 Edge+ or Samsung Galaxy Note 5, to really get the most out of these $249 (£224, AU$399) noise-cancelling cans. The Samsung Level On Pros have an almost space-age look to them. Our review unit had a reflective silver-gold frame and snow white earpads. 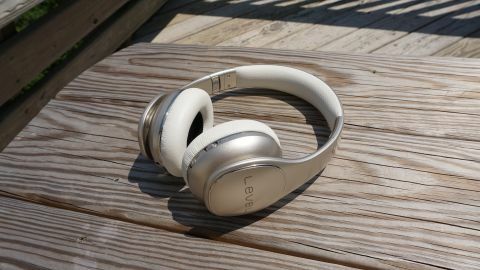 While Level On Pros are marketed as on-ear headphones they almost perfectly encircle the ears, with the pads just barely touching the outskirts of the ear. This makes them exceptionally comfortable – they're loose enough to hang on the ear for an hour or two without causing discomfort, and tight enough that they're not liable to fall off. On the underside of the bridge is a cushy white pad that seals the gap between the top of your head and the fragile-feeling plastic bridge. The pad itself is as comfortable to wear as you might imagine. The cheap plastic bridge, however, leaves a lot to be desired, especially for its price point. What I do like, though, is the fact that the Level On Pros fold up, allowing you to pack them in your bag without worrying about a heavier object smashing them in two. The buttons on the Level On Pros, similarly, are amenable, if not overtly simple. On the right earcup you'll find two switches, one for Bluetooth that also serves as a power button, and an ANC – or Active Noise Cancelling – button that does exactly what you'd expect. Connections-wise, you'll find an auxiliary jack – the Level On Pros come with a 4-foot 3.5-to-3.5mm cable – and a microUSB port that you'll use to charge the headphones in between sessions. If you're going wireless, the Level On Pros support Bluetooth version 4.1 and are compatible with the Sound With Me app that allows you to share your music with anyone around you who might also have a Samsung-made pair of cans. Samsung's website claims that Bluetooth is supported for up to 10 meters (30 feet), but I found that I'd often get disconnected after walking about half that distance. Instead of implementing physical buttons for play/pause, volume and track controls, however, the Level Ons have a touch-capacitive earcup that you'll use in their stead. But there's a huge caveat: unless you figure out which motion correlates to which command, it's a pretty difficult system to use. I gave them to friends and family to try out and, nine times out of 10, no one figured out how to work the controls. Space-age feeling, it seems, comes at the expense of usability. That said, an aspect where the Samsung Level Ons excel is in the battery life department. Samsung says that on a full charge the Level Ons can play on uninterrupted for up to 10 hours in Bluetooth Mode with ANC turned on; up to 20 hours in Bluetooth Mode without ANC; up to 18 hours with a wired connection with ANC and up to 600 hours on standby. Also, besides the aforementioned audio cable, the Level On Pros also come with a standard microUSB cable for charging and a faux-leather carrying bag. When talking about how the Samsung Level On Pro Wireless perform, you have to divide it into two experiences: using it on a Samsung phone and using it with everything else. If your handset doesn't sport the manufacturer's label, what you'll hear is a middle-of-the-road sound. It's warm, balanced and completely inoffensive. Songs like Renegade by X Ambassadors have a fair amount of flourish, but lack the same details you'd hear on a proper set of desktop speakers. That said, if you're using anything other than a Samsung device the Level On Pro's sound quality is close, if not almost identical, to the Beats Solo, the entry-level Beats pair of cans. Of course, it's a different game when you make the switch to a true Samsung cellphone. Not only do phones like the Galaxy S6 and S7 support AptX over Bluetooth (you can read about the differences in our Bluetooth vs AptX explainer), but also support a different codec called UHQ Audio. UHQ, or Ultra High Quality Audio, delivers 24-bit audio at 88.2kHz, or two times the frequency range of standard CD-quality wireless sound. UHQ provides a notable difference in audio quality. It's not enough of a difference to cause non-Samsung owners to run to the store and pick-up a handset to match their headphones, but it's enough to make these a good recommendation for any Galaxy lovers in your life. What everyone benefits from is the four mic Active Noise Cancelling that does a stellar job of stopping outside noise from melding with your music or video audio. A room full of people talking becomes your favorite audio track with the faces of your friends and acquaintances merely becoming a backdrop for the music. You'll see lips moving, but hear almost none of what they're saying. It's hard to compare ANC in a head-to-head sort of way (sound is easier to qualify when it's present than when it's not), but to my ears it seems like it's on par with Bose's cans. Unfortunately, though, using ANC adds a slight hiss to any audio track, slightly diminishing sound quality. It's almost inaudible and, so long as you don't get hung up on it, won't pester you for long once the music starts. It's hard to understate how comfortable the Level On Pro Wireless are. They fit snugly thanks to the large – and let's not kid ourselves here, over-ear – earpads. The padded bridge adds an extra layer of pillowy cushion in a spot most headphone manufacturers forget, and the control scheme is minimalistic. While the Level On Pro Wireless doesn't have amazing sound quality across the board, the UHQ codec means that at least Samsung Galaxy owners get to enjoy premium sound even if the rest of us don't. Despite a fair amount of heft, the Level On Pro Wireless still feel fragile in the hand – the plastic bridge means that one mistake could utterly wreck your $249 (£224, AU$399) investment. And while the middling sound irked me, it was really the obscure touch controls and short-range Bluetooth that were salt in the wound. The Samsung Level On Pro Wireless are one of the few headphones I've tested that feel like they're meant as a package deal for another device. Yes they'll work with every Bluetooth and 3.5mm jack-equipped handset on the market, but you're better off sticking to a Samsung device in order to squeeze every ounce of aural goodness from the UHQ audio codec. It's one of the comfiest pair of cans on the market, and one of the best noise-cancelling, too. If it had a better sound quality for the vast majority of cell phone users it would be an easy recommendation but, as it stands, really makes the most sense at checkout when purchased alongside Samsung's Next Big Thing.